More than 300 Classic, Vintage, and Muscle Cars plus Show Bikes will be on display on Lincoln Avenue in Bellevue, PA on Sunday, May 23 from 1 – 5 pm. Free ice cream, snacks, and games will be featured, along with a virtual cruise in a vintage vehicle and a “walk up show” on the avenue. Donations will be accepted to support Angelman Syndrome research and education. The Second Annual Car Cruise supports the new mantra, “Bellevue: Possibility Everywhere You Look”. 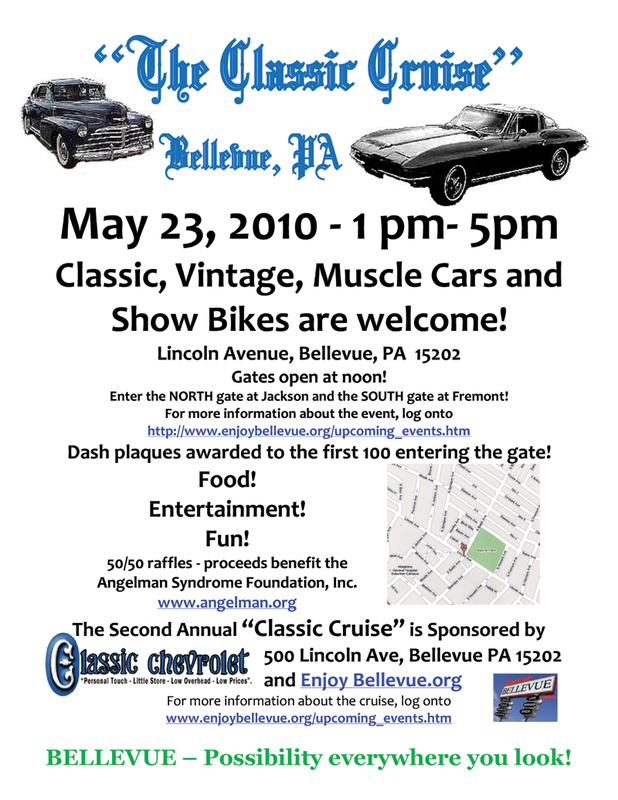 Get Revved Up in Bellevue at the Classic Cruise on May 23, 2010 from 1-5 pm. first 100 vehicles entering the gates. 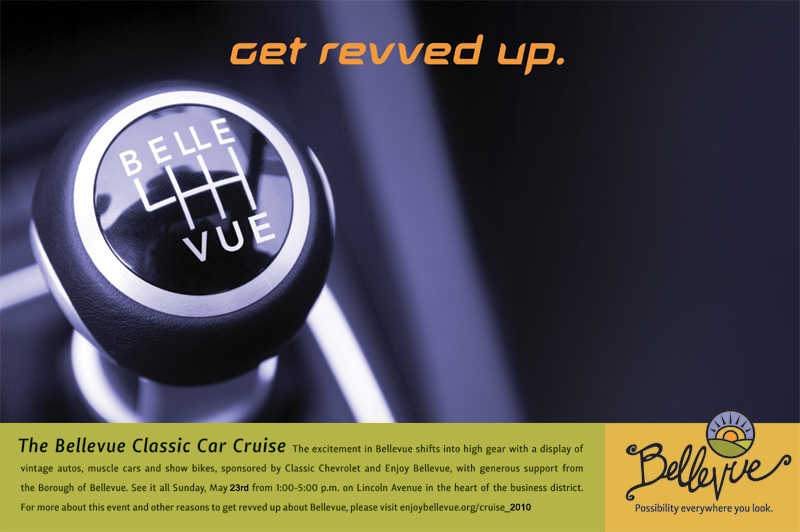 The second annual Car Cruise is yet another opportunity to advance the new mantra, “Bellevue: Possibility Everywhere You Look”. Kids can enjoy games and face-painting and be sure to stop by for a “walk-up” show at the old Linden Theater (510 Lincoln Avenue). Local restaurants and merchants will offer an array of food and merchandise during the sidewalk sales. Virtual rides are available in a vintage vehicle. Proceeds ($5.00 donation) for the “ride” and commemorative photo will benefit the Angelman Syndrome Foundation. There will also be a 50/50 raffle in support of the foundation. or log onto Cruise 2010 for volunteer opportunities. When: Sunday, May 23, 2010 1:00-5:00pm Lincoln Avenue “Gates” open at Noon at Jackson and Fremont.